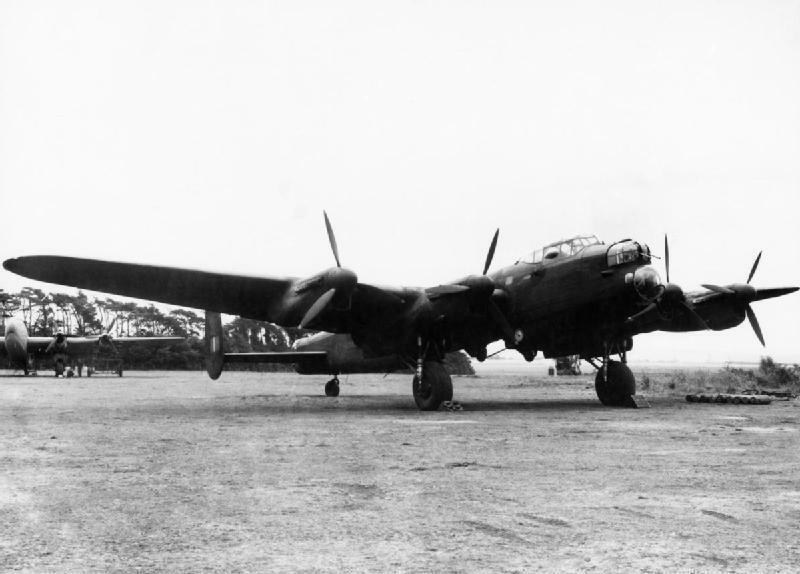 16–17 May 1943: Nineteen modified Avro Lancaster B.III Special long-range heavy bombers of No. 617 Squadron, Royal Air Force, carried out Operation Chastise, a low-level night attack against four hydroelectric dams in the Ruhr Valley. The purpose of the attack was to disrupt German steel production. It was estimated that 8 tons of water were required to produce 1 ton of steel. Breaching the dams would reduce the available water and hydroelectric power, disrupt transportation of materials on the rivers, and flood iron ore and coal mines and power plants. If the dams were destroyed, it was believed that the effects would be the same as attacks against 26 categories of industrial targets further down the Ruhr Valley. Led by 24-year-old Wing Commander Guy Penrose Gibson, D.S.O. and Bar, D.F.C. and Bar, a veteran of 172 combat missions, the aircrews of No. 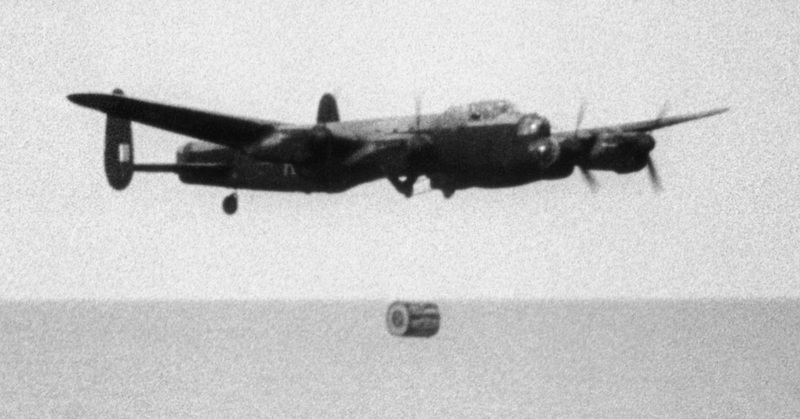 617 Squadron dropped a spinning cylindrical bomb, code-named “Upkeep”, from a height of just 60 feet (18.3 meters) over the reservoirs behind the dams, while flying at precisely 240 miles per hour (386.2 kilometers per hour). 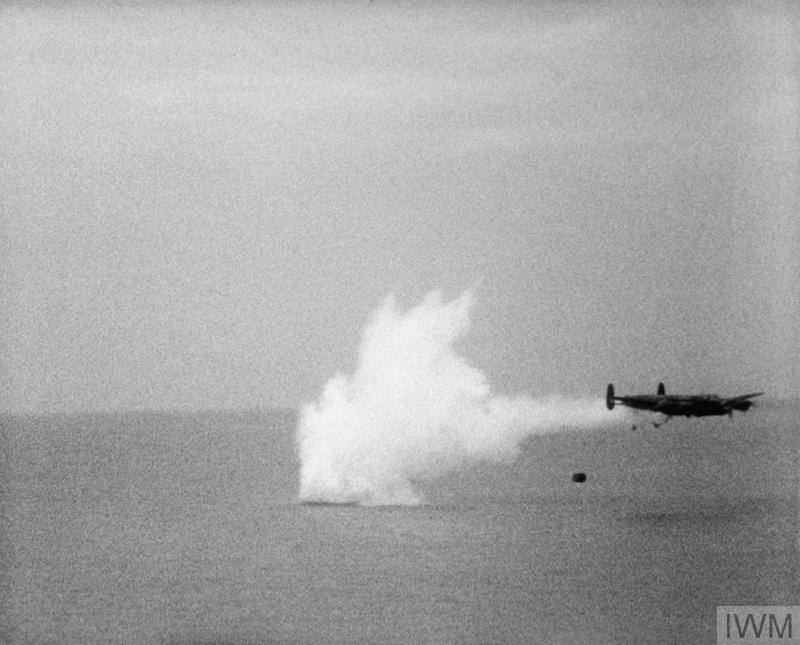 The 9,250-pound (4,195.8 kilogram) Vickers Type 464 bomb was designed to skip along the surface and to strike the dam, and then sink to the bottom. There, a pressure detonator exploded the 6,600 pound (2,994 kilogram) Torpex charge directly against the wall with the water pressure directing the energy through the wall. Nineteen Lancasters took off from RAF Scampton beginning at 9:28 p.m. on the 16th, and flew across the North Sea at only 100 feet (30.5 meters) to avoid being detected by enemy radar. 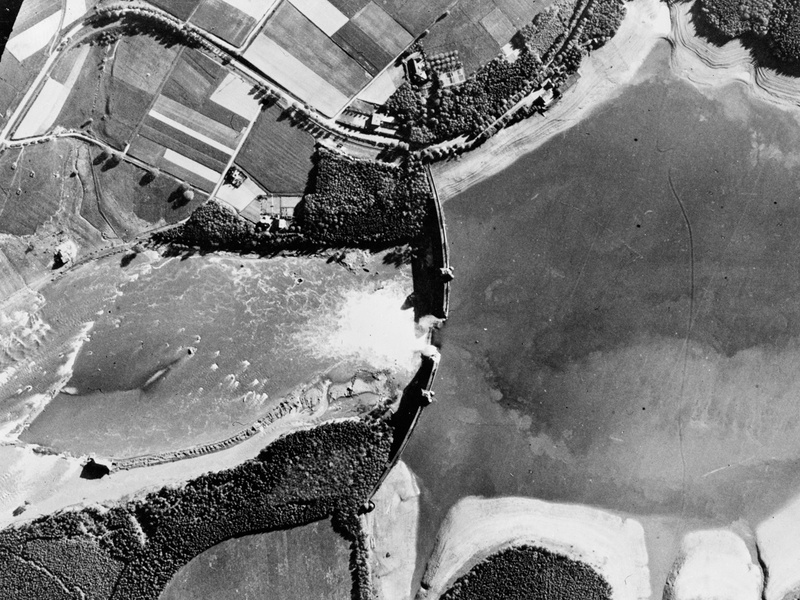 The bombers succeeded in destroying the Möhne and Eder dams and damaging the Sorpe. A fourth dam was attacked but not damaged. The last surviving bomber returned to base at 6:15 a.m. on the 17th. 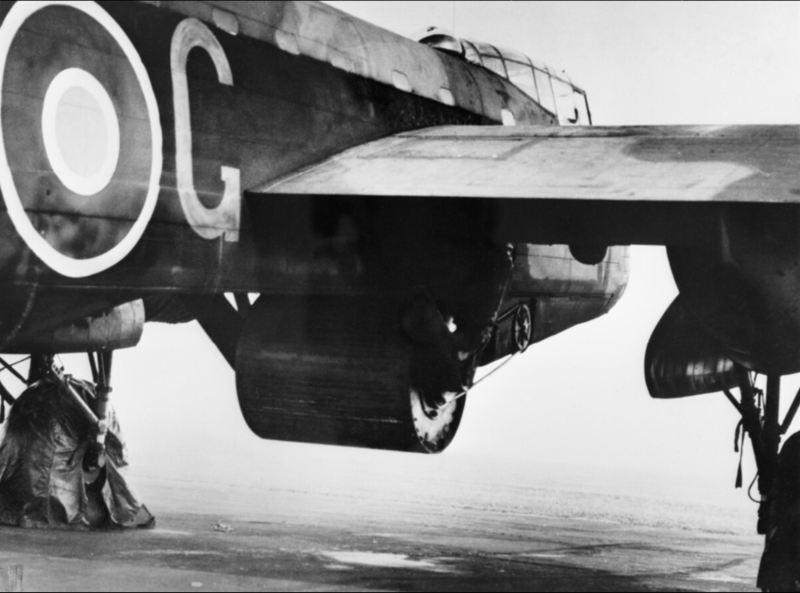 Of the nineteen Lancasters launched, two were damaged and turned back before reaching the targets. Six were shot down and two more collided with power lines during the low-level night flight. Of 133 airmen participating in the attack, 53 were killed. 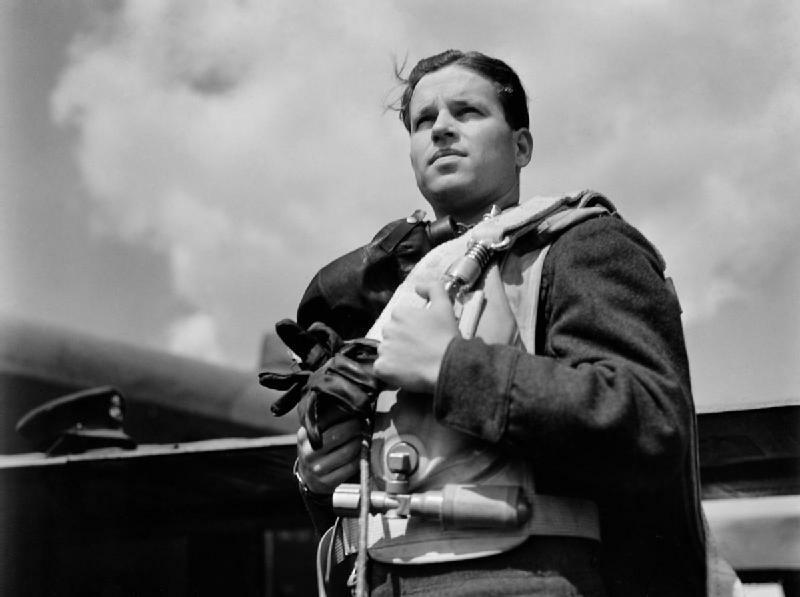 Guy Gibson was awarded the Victoria Cross by King George VI. An additional 33 survivors were also decorated. 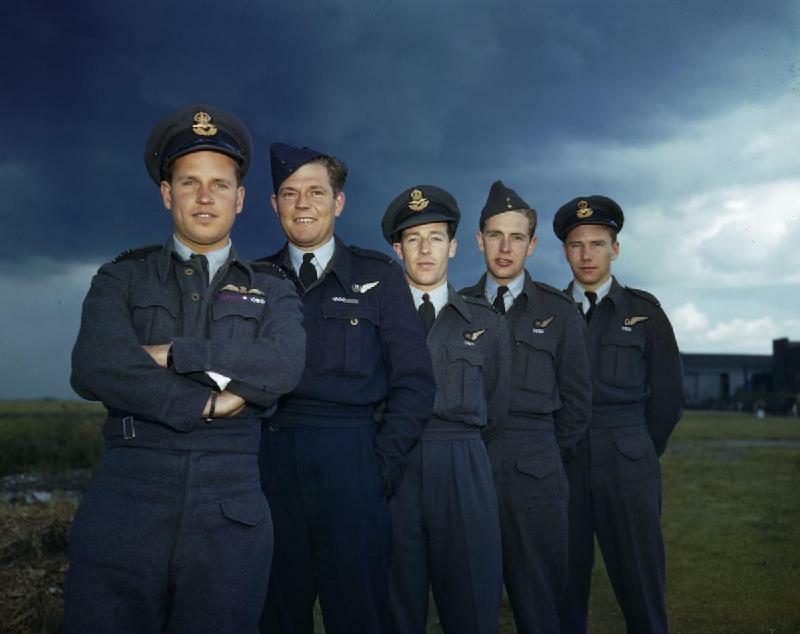 617 Squadron became known as “The Dambusters.” A book, The Dam Busters, was written about the raid by Paul Brickhill, who also wrote The Great Escape. A 1955 movie starred Richard Todd, O.B.E., as Wing Commander Gibson. There have been reports that a new movie is planned. 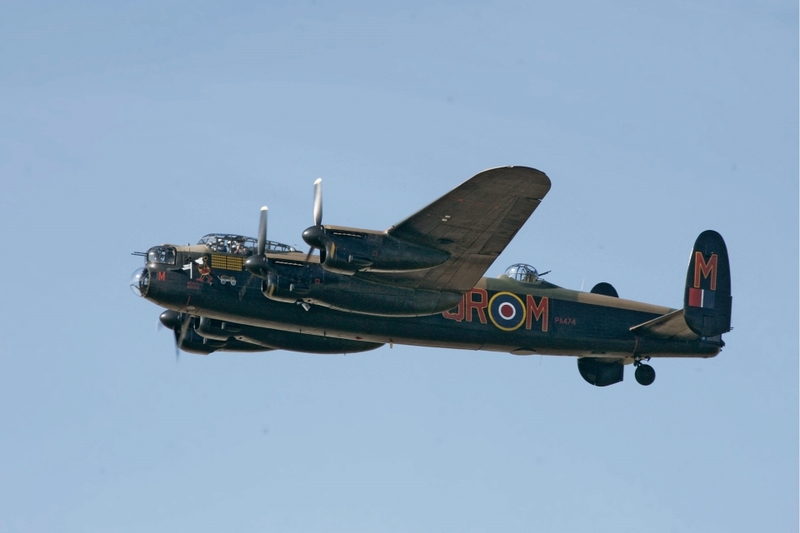 The Avro Lancaster B.III Special was a four-engine long range heavy bomber modified to carry the Type 464 bomb. It was operated by a crew of seven: Pilot, flight engineer, navigator, radio operator, bomb aimer, nose gunner and tail gunner. The “Lanc” was 69 feet, 6 inches (21.184 meters) long with a wingspan of 102 feet (31.090 meters) and overall height of 20 feet (6.096 meters). The modified bomber had an empty weight of 35,240 pounds (15,984.6 kilograms and a maximum takeoff weight (MTOW) of 60,000 pounds (27,215.5 kilograms). The Lancaster B.III Special was powered by the Packard Motor Car Company’s license-built version of the Rolls-Royce Merlin 24, the Packard V-1650-1 Merlin 224. These were liquid-cooled, supercharged, 1,648.96-cubic-inch-displacement (27.022-liter) single overhead cam (SOHC) 60° V-12 engines with four valves per cylinder and a compression ratio of 6.0:1. The Merlin 224 used a two-speed, single-stage supercharger. 100/130-octane aviation gasoline was required. The engine had a Normal Power rating of 1,080 horsepower at 2,650 r.p.m. and 9,500 feet (2,896 meters); Military Power, 1,240 horsepower at 3,000 r.p.m. at 11,000 feet (3,353 meters); and 1,300 horsepower at 3,000 horsepower with 54.3 inches of manifold pressure (1.84 Bar) for Takeoff. The Merlins drove three-bladed de Havilland Hydromatic quick-feathering, constant-speed propellers which had a diameter of 13 feet (3.962 meters). The propeller gear reduction ratio was 0.477:1. The V-1650-1 was 6 feet, 7.7 inches (2.024 meters) long, 2 feet, 6.0 inches (0.762 meters) wide and 3 feet, 6.6 inches (1.082 meters) high. It weighed 1,512 pounds (685.8 kilograms). These engines gave the Lancaster a cruising speed of 200 miles per hour (321.9 kilometers per hour) and maximum speed of 272 miles per hour (437.7 kilometers per hour). The service ceiling was 24,700 feet (7,528.6 meters) and maximum range was 2,530 miles (4,071.6 kilometers). Defensive armament for a standard Lancaster consisted of eight air-cooled Browning .303-caliber Mark II machine guns in three power turrets, nose, dorsal and tail. The Lancasters assigned to Operation Chastise had the dorsal turret deleted to reduce weight and aerodynamic drag. The gunner normally operating that turret was moved to the front turret, relieving the bomb aimer to deal with the operation of the specialized mission equipment. 7,377 Avro Lancasters were built. Only two remain in airworthy condition. 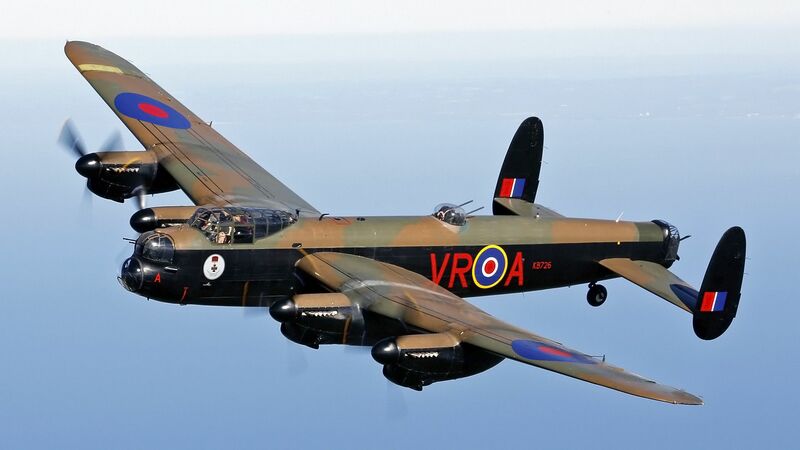 Victory Aircraft Ltd.-built Avro Lancaster B Mk.X FM213, marked as KB726, VR A.